SRINAGAR: Insisting that his Peoples Conference (PC) is the “rapid and fast emerging third party” in Kashmir, Sajjad Gani Lone on Tuesday mounted a serious attack on the two “dynastic” parties – the NC and the PDP. Flanked by Junaid A Mattu and Irfan Raza Ansari, Lone said his party worked day and nights and made no noises and reached this level. 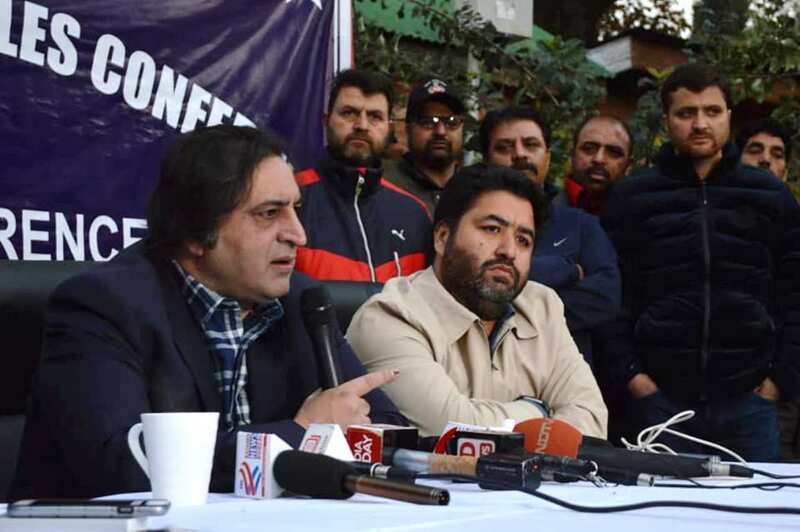 Sajad Lone flanked with Ifran Ansari addressed a press conference after the party won Mayor Position. Lone, who had stopped talking ever since the BJPDP government collapsed, precisely talked about four things. Firstly, if the NC and the PDP had “so-called” boycotted the municipal polls, wherefrom their corporators were born whom they started counting after the results? He said the heads of all the three parties -NC, PDP, and Congress, did talk on this and put in efforts as well. “We are happy they were united,” Lone said, “We are happier that they lost.” He said the three leaders had confabulations on the issue of Mayor Election. The two parties, he said, have not taken care of the city. “In Handwara which is a small town, there are 900 families registered under central sponsored scheme House For All,” Lone said. “In Srinagar city, there are only 3000 families listed.” He said they will work hard to improve the city. In order to explain his alliance with the BJP, Lone said he is not the first one. Omar Abdullah was the BJP’s first ally and then Madam – reference to Mehbooba Mufti, was there till her government collapsed. Without mentioning Omar, Lone said “I am not a chocolate boy” and when “the present leaders” were in Delhi, “I was being interrogated”. 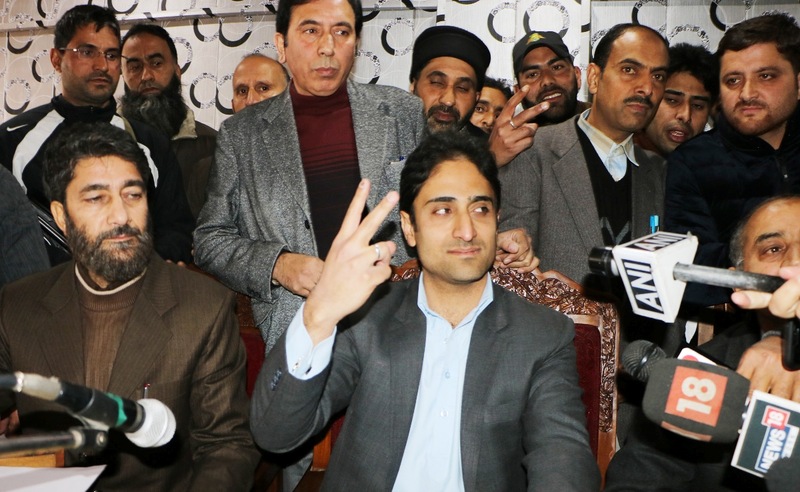 Junaid Mattu, in whose success the presser was apparently arranged, got into instant preaching mode as he took over the mike. Mattu said he has never side allying with BJP is poison. “Omar Abdullah allied with BJP at a time when we had no compulsion,” Mattu said. “Had he 20 seats in last assembly election, he would have set up a government with BJP.” He said people may take a moral high ground on the issue but the fact is that BJP is a reality. “We have lawmakers from Jammu who won with one lakh votes. How can we discredit them?” Mattu said he had problems with the NC when he was there. He said he was against the boycott of the municipal polls. Earlier speaking to the media at SMC, Mattu termed it “a historic election” and “the new beginning”. Interestingly, Mattu talked about the “chastity belt” in response to a particular question when asked about his plans in managing certain constructions. A reporter asked him that since the Omar Abdullah government had alleged that a car showroom in city outskirts was on wetland so was a construction in uptown illegally made but both the owners showed the papers, will the new Mayor go for demolishing similar constructions? Lone said both the constructions are legal and Mattu added that demolitions are an option. Does this clown understand the meaning of dynastic politics? ?